CD review: "Let Me In Your Heart"
The king is dead and the scepter, or in this case the accordion, has been passed on to his eldest son. While C.J. still points to his late father, Clifton, as the king of zydeco, his debut as leader of his father's band makes a strong case for crowning C.J. as the best living zydeco singer and accordionist. Rockin' Sidney and Rockin' Dopsie have played longer, and Buckwheat Zydeco is more famous, but "Let Me In Your Heart" stands on a plane surpassed only by Clifton. Much of the credit goes to Clifton's band which C.J. inherited  Harry Hypolite on guitar, Wayne Burns on bass, Joseph Edwards on drums and Cleveland Chenier on rubboard. But credit must also go to C.J. as leader of the band. His vocal, accordion and compositional skills all shine brightly on his first recording as leader. The album swings, rocks, dips and boogies with nary a letdown. "Check Out the Zydeco" starts the album off with a strong affirmation that the name Chenier still means zydeco. Penned by C.J., this ode to his father is an accessible, upbeat tune with great riffs and catchy melody. And while C.J. has hired a saxophonist since this album was laid down, his own alto playing sparks this song. He also trades accordion leads with just-added guitarist Selwyn Cooper. "I'm Coming Home" is a Clifton Chenier song which C.J. treats like an old family friend. While "I'm Coming Home" is a slow, bluesy piece, the band does better with uptempo shuffles like C.J. 's "She's My Woman." The rhythm section sets down a beat like a locomotive, which C.J. seasons with wild shouts and spirited accordion work between verses. Cooper also lays down some great blues tracks on guitar while C.J. exhorts him to do better  "Go on. Get on home!" C.J. phrases his accordion like a harmonica  short riffs and staccato notes, repeating phrases over and over with small but important changes each time, building to a climax that brings the song to a logical, satisfying conclusion. "Blue Flame Blues" is a traditional blues instrumental. C.J. 's sax solo is reminiscent of Eddie "Cleanhead" Vinson, with lots of throaty growls offset by skilled high-register passages. "My Baby Don't Wear No Shoes" is the second of three Clifton-penned songs on the album. Edwards sets his drum kit to dancing behind C.J. 's accordion intro. C.J. uses a flat, nasal singing style to set off against the rollicking rhythm for an offbeat but pleasant effect on the first verse. Then his growling vocals return and the song absolutely burns. "Let Me in Your Heart" is another straight blues from the pen of C.J., but with a zydeco bounce. The sweet, slowly undulating melody winds its way through the traditional story of a broken heart. This piece also serves as a fine example of C.J. 's use of asides to prod the band to higher levels of playing and to add character to a song. On "Bow-Legged Woman," the band returns to the quick tempo they seem most at ease with. On this tune, the band and C.J. exchange call and responses throughout, interspersed between the raucous verses. "Banana Man" is the last of Clifton's songs on the album, and C.J. leads the intro with a strong accordion solo. This song is another straight blues, and here C.J. plays the accordion more like a Hammond organ, with lots of trills followed by short runs. Cooper again gets a chance to shine on guitar, and rewards the listener with feisty solos that push C.J. on accordion. "I'm All Shook Up" is a broken-hearted but light blues with C.J. 's accordion once again sounding like an organ. "Used and Abused" is a slow shuffle, with C.J. nearly intoning the intro and first verse. "I'll Be Long Gone" closes the album with that infectious boogie beat the band seems to relish most. 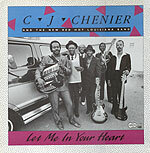 "Let Me In Your Heart" is solid evidence that while the Chenier sound is now more contemporary, more uptempo than when Clifton handled things, C.J. is loyal to his zydeco heritage  and that the name and music are in good hands.